I don’t think I’ve ever mentioned this, but, since my blog supports the natural hair community I thought I should let interested persons know this tidbit. If you have a twitter account, join the conversation by tweeting using the hashtag #naturalhair….not #natural hair but #naturalhair. Make sure there is no space between the natural and the hair or else you will be joining the wrong conversation. 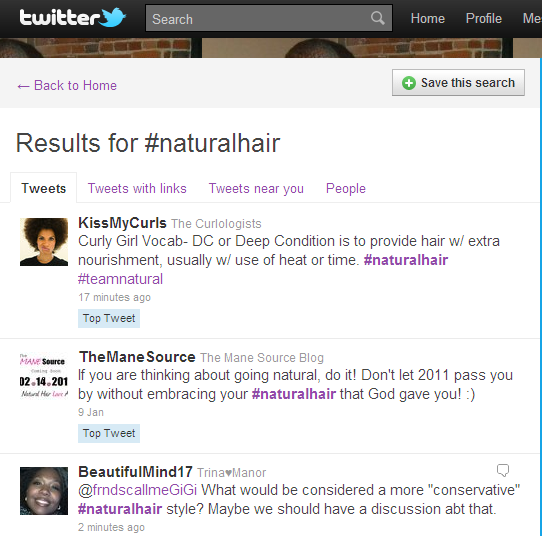 You can also click on the resulting link to see what other people around the world are tweeting as it relates to natural hair. You will then be able to tap into information and experiences from people all over the world! Wonderful website. A lot of useful information here. I’m sending it to several buddies ans also sharing in delicious. And naturally, thanks to your sweat!